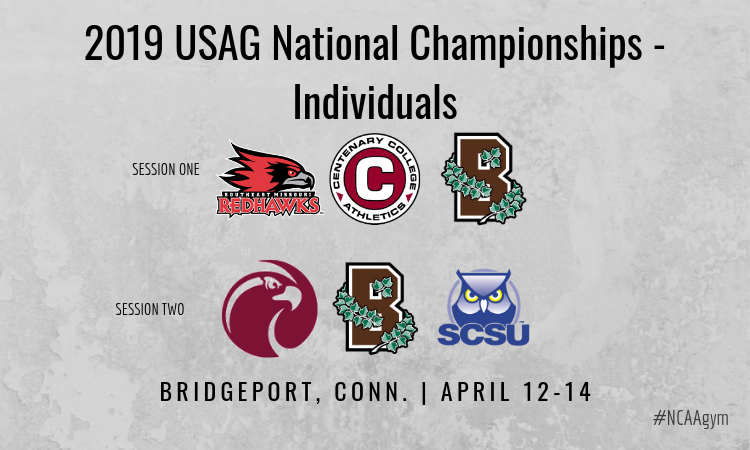 While the top DI teams in the country are focusing on resting and polishing little details in preparation for the NCAA national championships next weekend, the best programs with fewer than seven and a half full scholarships take center stage in Bridgeport, Connecticut, this weekend for the USAG National Championships. Semifinals for teams and individuals will take place Friday with two sessions of competition. The top two teams from each session advance to team finals Saturday while the top individuals on each event will compete in event finals Sunday. The top all arounder on Friday will be crowned national champion. 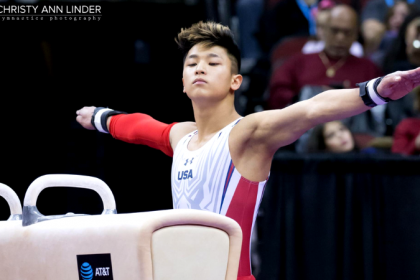 If you’re new to the USAG-watching ranks, you’re in for a thrilling competition. For one: Event finals! USAG is the only women’s championship to retain everyone’s favorite competition, and they’re usually amazing to watch. The all around, decided by Friday’s qualifications, could also come down to the wire. Make sure to check out CollegeGymNews.com throughout the week and weekend for full coverage of the championships thanks to Katie Norris who will be there reporting and Emily Howell-Forbes who will be there taking pics. Courtney Mitchell has been at the front of the pack all season, but she was restricted to bars at NCAA regionals after a presumed injury at conference championships. If she can’t compete in the all around, we’re most likely to see a battle between UIC’s two all around leaders. At their best there’s little to separate the two, but Baddeley is slightly more consistent. Lindenwood’s second all arounder Ryan Henry has been quietly excellent this year, beating Division I stars like Gabrielle Cooke and Jovannah East. She’ll be there if the others stumble. If Mitchell is back it’ll be a game-changer. Otherwise, keep an eye on TWU junior Bria Northrop. She doesn’t seem to have found her groove in 2019, but she’s spectacular to watch and can produce some of the highest scores in the field. If she puts up a good number on vault in the first rotation, look out. Bridgeport freshman Julianna Roland has been overshadowed a little, but the ECAC-II Rookie of the Year hasn’t missed a routine since January. If she doesn’t make the all around podium this year, it’s only a matter of time. SCSU newcomer Hannah Stahlbrodt already seems to own half of her team’s record book, and while a top-three finish might be a stretch, she’s bound to pick up some of the program’s best-ever results at nationals. Just like in competition at the NCAA level, vault is a bit of a wildcard event because so much depends on landings, which always have an element of randomness. USAG nationals boasts some of the country’s best Yurchenko halfs. Riley Mahoney, Donna Webster, Courtney Mitchell and Gabrielle Kistner all do them beautifully and are capable of sticking. Julianna Roland, Kayla Baddeley and Jordan Boogerd are leaders among the Yurchenko full crew. There are a handful of gymnasts with 10.0 vaults floating around lower in the rankings, including Lena Wirth from Seattle Pacific and McKenna Kissinger from West Chester. It isn’t unimaginable for one of those athletes to have the vault of a lifetime and walk away with a win. 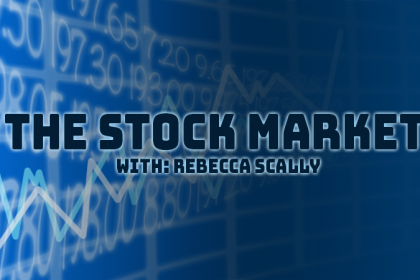 Salamone is the most obvious title pick of the individual field. The MPSF champion has been rock solid all year and has the highest NQS of any USAG routine in 2019. She’ll have to get through reigning champion Jessica Wang, who is having an outstanding senior year, and numerous other gymnasts who have scored 9.900 and above this year. Kathryn Doran does one of our favorite Jaegers and has gone up to 9.925 in 2019. Toni Alicke’s fun routine is our pick from a great set of UIC contenders on this event. West Chester’s beam rotation has been a big deal this year. Sophomore Yolanda Nodarse has had a breakout season on this event and Sarah Boyd is stylish as ever, and hasn’t had a fall on beam in over two years. Perpetual beam powerhouse Lindenwood has three beamers in the top ten, and TWU senior Erin Alderman has been a rockstar on this event this year. If either Baldovino or Mitchell is healthy enough to compete beam, the landscape of this final could change considerably. Watch out for Yale’s Lindsay Chia and Lindenwood’s Emily Milliet on this event too—they’re a little less consistent than the top group but incredibly pretty. The depth on floor at this meet is incredible and we’re already sad thinking about the routines that won’t make event finals. Tyler Davis and Maya Reimers are defending national champions. Alisa Sheremeta and Anna Kaziska have gotten 9.900 after 9.900 this year, and Cornell pair Izzy Herczeg and Claire Haklik have been on fire in the second half of the season. 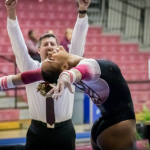 There are numerous great floor gymnasts outside the top ten, too, including Centenary fan favorite Navia Jordan and several of the top all arounders. Mikailla Northern and Erin Alderman could close out their collegiate careers in the floor final, making everyone cry in the process. Great article , I’m hoping your preview is way off base . Missed the mark on a couple of MIC and State champions from UIC who didn’t even get mentions ( oh and who were also NCAA regional qualifiers) fortunately these girls love being the underdog, under the radar winning weekly and tournament championships without the hoopla! Hi there, Thanks for reading! 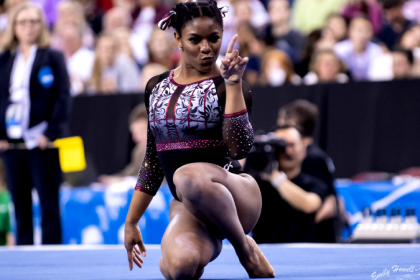 Unfortunately, we can’t mention every deserving gymnast in our articles but rather chose to highlight a handful from each team, primarily focusing on the top, rankings-wise, simply for logistics purposes. Again, thanks for reading the site, and we hope you come back to check out our coverage of the whole championships weekend!